Leicestershire successfully chased a revised target of 309 in 49 overs to beat Lancashire in the two sides' One-Day Cup group opener at Old Trafford. 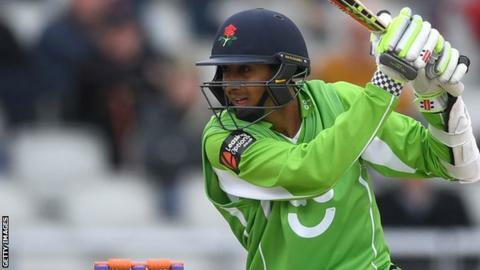 England's Haseeb Hameed, playing in his first ever limited-overs match, struck nine fours in his 88 off 101 balls as Lancashire posted 314-8 in 50 overs. James Sykes' 4-57, his best one-day figures, included the wicket of Hameed. After a rain delay and a middle-order wobble, the visitors got home by three wickets with four balls to spare. Mark Pettini (59), Cameron Delport (62) and Mark Cosgrove (67) set the foundations but, after an over had been lost to rain, Leicestershire then lost three quick wickets to slip to 244-6. However, Tom Wells, Rob Sayer and Zak Chappell each chipped in with valuable runs to see Leicestershire to victory in their first group match. One positive for the beaten hosts was the display of Hameed, who has appeared in 29 first-class matches for Lancashire, England Lions and England, but had never before featured in a limited-overs match at senior level. "The rain helped the wicket out in the second innings. The ball skidded on, and it was slightly nicer to bat on I'd say. We probably got the wrong end of the conditions, but that's how it works. "We felt our bowlers would come into play with the skills they have. But those skills weren't as beneficial as they would have been had the wicket stayed as it was. "It was my first one-day game in a long time, and it was nice to get out there and experience that at this level. I've got a lot of learning to take away." "This is what we're about. Coming to Old Trafford against a good side, we held our nerve in pressure situations. "Our spinners bowled together and it worked for us. The wicket was very dry. We had a very young bowling attack, and they really stood up. "Perhaps the last two overs in their innings when we dropped three catches cost us 20 runs, but I'm very proud of this young bowling attack."